Julian Salvi has vowed to assist Taunton Titans in “any capacity he can” as the National Two South side aim for promotion. 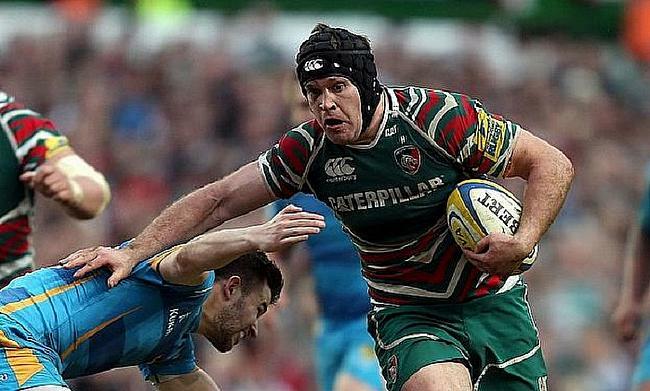 The former Leicester Tigers and Exeter Chiefs man joined the Somerset club at the beginning of this season in a player/defence coach role after retiring from the professional game in June. As things stand, the Titans sit second in the league standings with a trip to London Irish Wild Geese to come this weekend. “It’s always nice to start with a new club and it has been great to get ingrained into the culture and the environment,” Salvi said. “It [the decision to join Taunton] came off the back of having a sit down with Head Coach Tony Yapp regarding my playing ambitions. It was one of those when I retired from the professional game, I still wanted to play. “Tony suggested there was an opportunity up at Taunton to do it when I can. I’ve been training every week and when I can play, I will put the jersey on. The back-rower has already made an appearance for Taunton this term having started their Round Three victory over Clifton and Salvi wants to gain as much playing time as possible for the Titans whilst also balancing his full-time work as Exeter Chiefs’ defence coach. “Obviously coming from the Exeter Chiefs mould and being a player there to now slightly stepping away from the game with Taunton, has been good for my mental space in terms of still wanting to play and still being involved,” added Salvi. “I played against Clifton a couple of weeks ago on a Friday night which was my first taste of Nat Two rugby which was interesting, but it’s going well! “I do have to get the balance right with the Chiefs. When I can, I would like to put the Taunton jersey on and I like to think I can get between five and 10 games this season. The 32-year-old’s desire to continue playing burns bright and with his strong links to the Chiefs, Salvi can also see the importance of the National Leagues for young players who want to develop their game. Taunton have a good relationship with the Chiefs and they have benefited from the loan system in recent years with the likes of Joe Simmonds plying his trade with the Titans whilst also being on the books at Sandy Park. "Every time that Anglo-Welsh Cup comes around, he's bang on in his preparation." Joe Simmonds has had to be patient for his chance behind a club legend, but he's taken it and impressed Rob Baxter in doing so. Salvi added: “I think the key thing with the young kids coming through is the fact that they get game time week in, week out. “To allow some of the Chiefs’ academy players to be linked with different teams in the National Leagues, like Taunton, is quite crucial. Having reached the top of the game himself, Salvi’s attention is now on National Two South and Taunton this term. Tony Yapp’s side have been one of strongest teams in the division over the last few years, but they have failed to break into the top two despite starting campaigns impressively. Once again, Taunton have begun this season on the front foot having secured four wins from their opening five fixtures and Salvi is keen to help the side take the next step in 2018/19. “It is a good start. We are sitting quite nicely in the table, but we know there is room for improvement,” Salvi said. “That is the great opportunity for us because we know we can get better and we are putting ourselves in the position to do so. “Everyone is working hard and everyone is on the same page and hopefully come Christmas time, we are there or thereabouts and we can push on in the second half of the season. “Where Taunton might have struggled previously is that they have been in a very good position at Christmas, but then they have fallen away. “It might be because it is a different type of rugby because you go from a bit more sunshine when you are throwing the ball around to wet weather rugby and you need to evolve to those situations. Both Taunton and Exeter Chiefs have started their respective campaigns very positively and both will have ambitions to succeed this year. For Salvi, his aim is to help his affiliated clubs achieve as much as they can. He concluded: “To have both do really well, would be the ideal situation! For me, I would love to push Taunton as genuine promotion contenders and that is something we are working towards. “Likewise, with the Chiefs, we are going to be pushing hard in the Premiership and pushing hard in Europe which starts in the next couple of weeks.